Theme: God’s faithful and generous people know the rest of the story about Jesus’ death, the empty tomb, and the resurrection, and fearful though we may be, we know that the joke’s not on us. This is amazing good news for all eternity. The original ending of Mark’s gospel is my favorite Easter gospel precisely because of its “unfinished” nature. The other gospel accounts are compelling in their own ways, but I appreciate the chaos and tension with which Mark leaves us—at least until the editors got hold of the text and tried to tie up the loose ends in verses 9-20. Mark’s original ending seems more real to me in the sense of how human nature works, as well as how God works with our messy humanness. Plus, a really good story resists a tidy ending, and the story of Jesus is, after all, the ultimate story for those of us who know it deeply in our bones and heart. The account itself is simple. In the midst of the horror of Jesus’ death, his followers keep the Sabbath. When the day is over, the women do what women do and buy spices to finish the process of burial. They are worried about an important reality: How are they going to move that enormous stone covering the tomb? Their minds are fixed on the task ahead and the difficulty they assume awaits them. 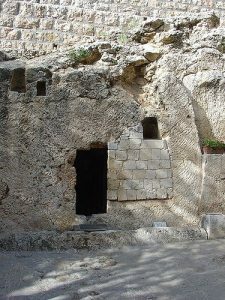 No wonder they are shocked by the sight of open tomb. No wonder they are unsettled by the presence of the young man in a white robe hanging out inside. The news he shares with them—about Jesus being raised—is even more alarming. They see quite clearly that their beloved teacher’s body is not there. The young man gives them instructions which they promptly ignore due to their amazement and fear. In fact, they take off running and don’t tell anyone about their experience. The End. Not! Clearly, they ended up telling somebody because this good news spread quickly, Jesus shows up as promised (and continues to do so in bread, wine, water, and word when his people gather), and the Holy Spirit ignites the church. And here’s the thing worth telling: There still isn’t an end to the good news that Mark announces. We are all part of the story today. We are still responding in shock, amazement, disbelief, fear, and terror when confronted with the story of Jesus. Some of us are more akin to these first witnesses than we realize because we have said nothing to anyone about Jesus. We, too, are afraid to share what we have encountered. The news of a risen Christ is fantastic stuff that defies all logic and reason. It is a radical story that, if we allow it to, has the everlasting power and distinct probability to change life as we know it. All we have to do is let it do that. Like those first witnesses, those bold women, we have to let go of the fears that silence us, of the reason that binds us, and open our eyes, hands, and hearts to the promise that is already ours. Like it or not, believe it or not, we are Easter people, holy and beloved fools for Christ. Even though this Easter falls on April Fool’s Day, the joke’s not on us, dearly beloved. The joke’s on death and the powers of darkness. We get the last laugh, a joyous, infectious and cantankerous eternal and spontaneous side-splitting roll. Ditch your fear, holy fools, and let the living, loving, and telling begin. Christ has died. Christ is risen! Christ will come again! Amen. Most worshiping communities will pull out all the stops today with festival worship worthy of our risen Lord. And then we have Mark’s strange gospel. Why not give people a paper “stone” cutout or a small rock and invite them to leave it at the foot of the empty cross, to leave behind whatever fear is holding them back from living the life God desires for them. Invite them to leave behind their anxiety about sharing the good news and go forth into the world with confidence that Jesus goes with them. Do everything you can to inspire joy and laughter and as many “alleluias” as you can muster. God is doing a new thing again and again and again, and we are part of the resurrection story. Chances are you won’t have a lot of time with youth today. Consider having your youth sponsor an Easter “photo booth” where congregants can get their pictures made before they enter for worship or after they leave. Have an abundance of Easter-themed photo props, a few empty frames for folks to hold, and either use Polaroid film or take digital photos and post them to your congregation’s Facebook, Instagram, or Flickr account where people can download or tag themselves. This year tell the traditional story about the Mary Magdalene egg. 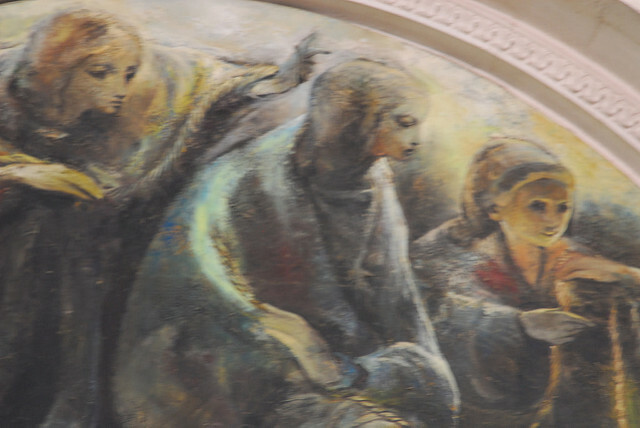 Begin with Mark’s gospel, how Mary came to the tomb and ran away in fear—her voice silenced. Ask the children if they have ever been afraid of something. But that wasn’t the end of the story. According to tradition in the Orthodox Christian Church, Saint Mary Magdalene went to Rome to see the emperor after Christ’s crucifixion and resurrection. She denounced Pilate’s handling of Jesus’ trial and began to tell Caesar the story of Jesus’ resurrection. To illustrate her point, she reached for a hen’s egg on the dinner table. Caesar was unmoved by her story, saying that there was as much chance of a human being returning from the dead as there was for the egg to turn red. Immediately the egg in Mary’s hand turned bright red! This is why Orthodox Christians exchange red eggs at Easter. Give each child a red Easter egg (boiled or wooden), and tell them to share the story of Jesus with others and don’t be afraid. What fear is foolishly holding you back from living the life God desires for you and from sharing the good news of Jesus with others? Remember that the first witnesses to the Resurrection also experienced fear and silence. They eventually began to tell the story and the good news continues to spread today. Be encouraged! Be bold! Be a steward of the greatest story ever told by spreading this good news around. If you did last week’s activity of filling a mason jar with ideas of how you can pour yourself out for others for the sake of the gospel, start sharing these gifts to honor Jesus and share the good news all during the fifty days of Easter. If you didn’t complete this activity, then cut out and color some paper Easter eggs. Write notes of encouragement on them or funny “church” jokes to provide a good laugh. Hide them each day this week where others will find them as a way to both share God’s love and light and help others have a much needed chuckle. Photos: Trishhhh, amanderson2, and Monastery Icons, Creative Commons usage license. Thanks!